Service kit for the Solex Mikuni 32 PHD carburetors as used on the 1980 - 1982 Suzuki SJ20 4WD. Please compare your old parts carefully with the ones in the picture. In some cases, it might be necessary to disassemble your carburetor to compare the individual parts prior to purchase. Please note that the PHD was produced both as Solex PHD and under license by Mikuni. The Mikuni PHD can be found HERE. The Solex PHD can be found HERE. Although these carburetors were originally delivered on the above cars, they are often transplanted onto other cars and engines so the range of vehicles that these service kits might fit is much broader. Alternatively, your car might no longer be equipped with the carburetor that it left the factory with. 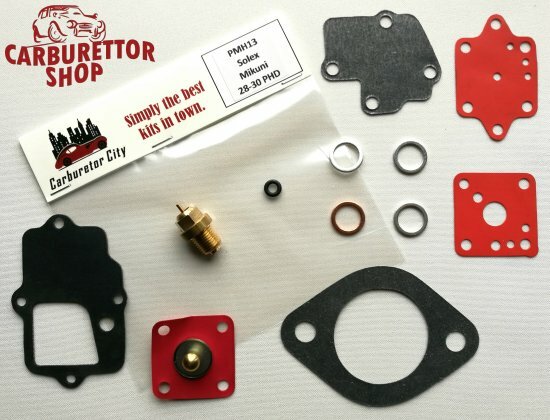 This is a Carburetor City service kit of outstanding Italian manufacture.